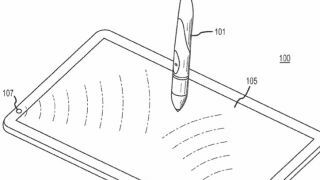 Apple has patented a couple of potential stylus solutions for the iPhone and iPad. The first is an optical stylus; it has a camera at the tip which tracks special pixels and invisible markings on the screen to input directions. The second relies on haptic feedback using a haptic actuator and short-range wireless receiver. It uses the bezel of the iPad or iPhone to receive vibration commands, which seems a rather round-about way of doing things. It's not the first time Apple has mulled over the stylus conundrum. In 2010 it patented a pressure-sensitive stylus for low-res touch panels. And in the '90s the Apple Newton MessagePad actually had a stylus. We're not really expecting to see Apple launch a stylus alongside the iPhone 5 or next iPad or anything, but it's interesting to see the direction Apple could go in if it decides to hop aboard the stylus gravy train. That's a train boarded by Samsung with its so-called 'phablet' Galaxy Note and the S Pen which is soon coming to the Galaxy Note 10.1.